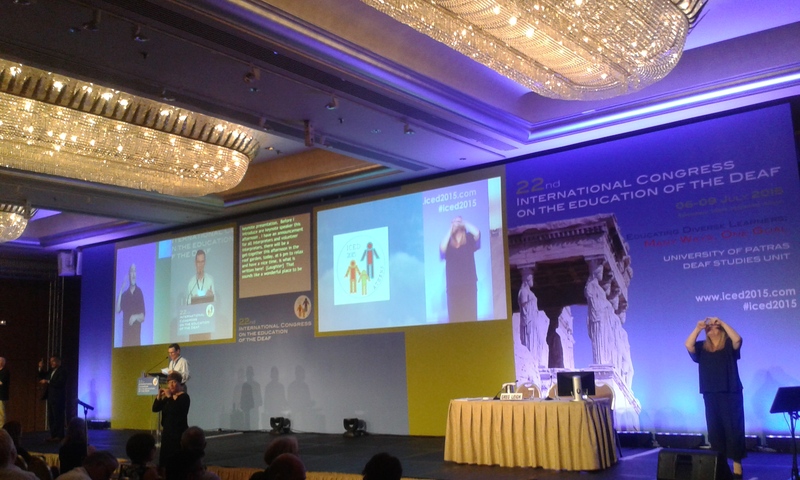 In June 2015 the International Congress on the Education of the Deaf (ICED) – „Educating Diverse Learners: Many Ways, one Goal„ took place in Athens, Greece. Two representatives (Piret Põllu, Raili Loit) from our association also attended the event in order to make professional contacts for further possible cooperation and gather information about the present situation in the field of Deaf education in Europe as well as in the whole world. ICED is one of the oldest and the most prestigious body of inquiry in the field of Deaf education. The first congress was held in Paris in 1878, and since 1970 it is organized every five years in different countries. The congress in Athens lasted for four days and the program focused on deafness in very many different aspects. More than 400 presentations were offered in the field of language and literacy, sign language and bilingualism, emotional development and mental health, sensory and cognitive diversity, early intervention, CI, curriculum and learning environment, technology, teacher training, lifelong learning, employment and mobility. The congress was very interesting and offered a good overview about what is going on in the field all around the world. It was refreshing to acknowledge, that general problems and views in the education of hearing impaired children are quite similar in all countries. The next ICED congress will be held in 2020 in Australia, Brisbane – hope to see you there!